Since revamping the entire Trendsmap platform at the end of 2016, we’ve been working hard this year on adding even more exciting features to Trendsmap. It’s been a while, and it is well past time to round up the new features and packages options which Trendsmap has to offer. 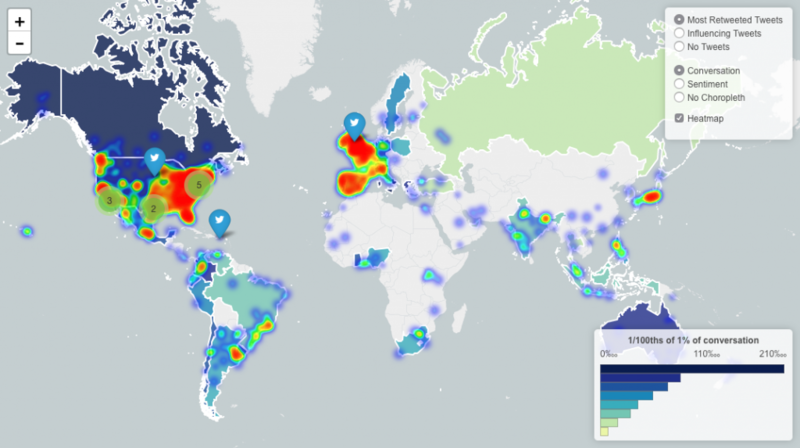 The latest tool to be added to the Trendsmap repertoire is the Global Top Tweets tool. This tool allows you to see the top tweets across the entire globe from either the past one hour, 4 hours, 12, hour or 24 hours. The results provided by this tool are updated constantly ensuring that you have access to the most up to date Twitter trends from around the world. The Global Top Tweets tool also makes use of a proprietary spam and bot detection analysis feature which helps ensure that the top trending tweets are natural, and are coming from real users, and not bots! As this tool has just been released, we felt like it deserves it’s very own introductory article, so you can read more about this exciting new tool and the features which it has to offer. Top 100 Tweets – This new tool comes with a number of filtering options to allow you to quickly find the most interesting tweets. We’ve updated our subscription options to include Trendsmap Pro and Trendsmap Premium, to go alongside the existing Trendsmap Plus. These new subscriptions boast an array of powerful new features allowing you go into incredible depth with Analytics, Visualisation and Alerting so you can get the most insight in a timely way from the Twitter platform. You can analyse and visualise up to the last 5 weeks of tweets with Premium, (2 weeks with Pro) which allows you to easily see how activity has changed over more than the last month. 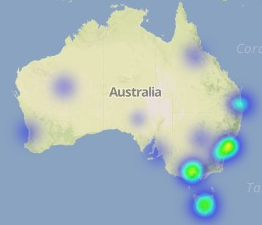 A heat map showing the location in which the highest number of people are discussing a particular topic, where the conversations surrounding these tweets are most active, and where the most popular tweets are coming from. Information on the total number of tweets discussing a particular topic. 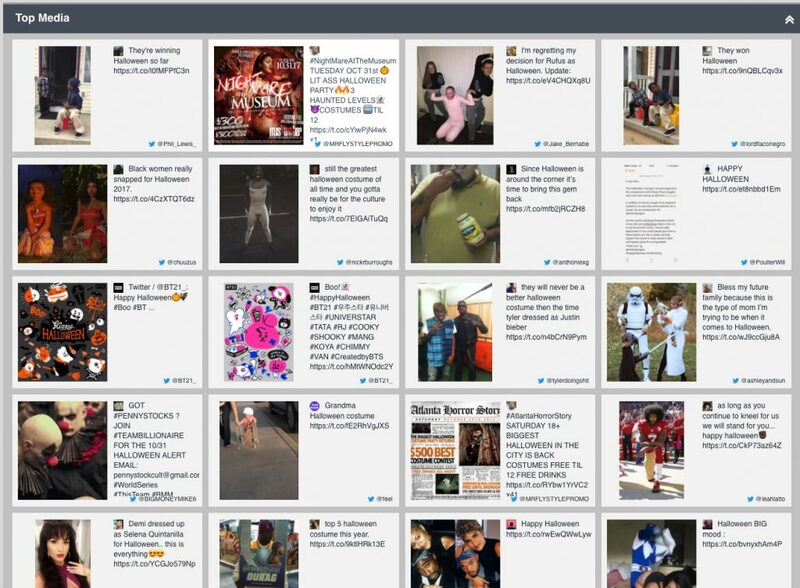 Detailed lists of the most popular tweets, media, urls, and accounts surrounding a particular topic, including no. of retweets, replies, quotes etc. Sentiment analysis data showing where people are reacting most positively or negatively to particular topics. Information on the different hashtags, words and even emojis associated with particular topics. The Trendsmap Visualisation Tool allows you to create engaging animated visualisations based around tweets from anywhere in the world. Advanced controls allow you to completely customise the visualisation display to suit your needs. 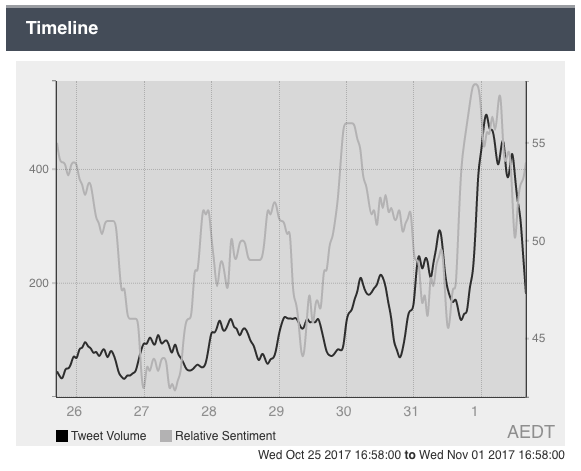 Using a custom colour scheme and a range of display options, this tool allows you to show multiple trending topics simultaneously whilst also allowing you to choose the specific time frames of tweets. Show actual topic words on the map instead of points. Control the length, speed, detail in the animation. Use a range of options to change the style used to display the words or points on the map. Specify the country, state, city or region where the tweets are coming from. Choose the language which tweets are written in. The Trendsmap Visualisation Tool gives you an extensive range of customisation options. The alert system is a great way to keep on top of trending topics which are important to you whilst on the go, and alerts can either be setup manually or through the Analytics tool. A feature of the Premium subscription is being able to integrate the Trendsmap alerts with Slack, so you can be notified of trending tweets relating to your query through this channel. Using the Analytics tool, alerts are quick and easy to set up. Simply enter your query into the tool, click ‘create alert’ and then choose the frequency in which you would like to be notified about the status of this query. Setting up alerts manually allows you to be even more specific with regards to exactly what hashtags you wish to be notified about. The alerts will be sent directly to email address which is attached to your account, at the frequency which you selected. It’s as simple as that, do note however that depending on how specific your query is, and how popular the topic is, the number of tweets you receive in these alerts will vary, with the initial alert often containing more tweets than subsequent alerts. These additional features, alongside the revamped interface of the Trendsmap platform as a whole, make it a more powerful and invaluable tool than ever when it comes to analysing Twitter data and trends. As we want you to get as much value as possible out of these new tools, over the coming months we will be releasing more in depth articles and guides surrounding them, providing you with the right information to use them to their maximum potential. After all, this really is just the tip of the iceberg when it comes to the features which these tools can offer you and your business, and the options for tweet analysis, reporting, data export are endless! We’d also love to hear your feedback on our new tools; things you like about the tools, areas in which you feel they could be improved, even suggestions for new features which could make these tools even better! We’re open to all ideas here at Trendsmap and can’t wait to hear your thoughts! Stay tuned for more articles coming your way soon. Faster page loads and enhanced security via the use of https (http/2) across the board. Three new map backgrounds to choose from. See the top tweets for global and local trends, as well as top tweets for each city and country. See how many tweets there have been for a trend. New sign up options. As well as Twitter, you can now register via Instagram or Facebook. Simplified registration process to reduce the time required to gain full access. We have also changed the primary URL of the site to https://www.trendsmap.com/ as part of this change, though for the time being the old one is still accessible. For a very quick overview of the new site, checkout the video below, and otherwise feel free to go forth and try out the new site! Looking ahead, we have some major updates to our existing Analytics and Visualisation tools, as well as the introduction of a brand new alerting tool. As always, if you have any queries about any of this, please get in touch. Last week we had our biggest “viral” experience, and it was such an intense and fascinating experience that we thought we should document it. Last week we had our own most “viral” moment to date, and it was such an intense and fascinating experience that we thought we should document it. In short we created a visualisation that wasn’t necessarily the best looking, innovative or enlightening one we have ever made, but through various factors it was viewed more than 270,000 times, 100 times as much as our typical visualisations are. September 18th saw the Scottish Referendum finally come to vote. We had been watching the build-up on Twitter for some time so knew that the #Yes campaign was significantly more vocal, at least in Scotland, which was very much at odds with the Polls. That same week we had added some new functionality to our visualisation tool which enabled displaying words rather than just bubbles, so we thought it could be a good opportunity to see how that looked for the #IndyRef. We created a visualisation, focused on the UK, which illustrated the strengths of where Yes and No were most popular. We used the three most popular hashtags for each camp – #voteyes, #yesscotland, #voteyesscotland for Yes, and #voteno, #bettertogether, #nothanks for No. You can see the visualisation here. Sure enough it was very visually striking, particularly because how geographically diverse the Yes and No camps were. Scotland looked to be all Yes and England all No. It was also interesting to see so many Yes votes from around the world. Words also worked well for this visualisation because they were short, and in this context it felt more emotive than circles. We had also been working on the creation of animated GIFs for our visualisations so thought it a good opportunity to see how much they increased the visibility of our tweets. From the moment we tweeted out the visualisation, we could see it was getting shared widely and quickly, much more than normal. Within about 30 minutes it was our most retweeted tweet, and we assumed it would tail off again quite quickly. Soon though it hit a new level which it sustained as it began to be shared in timezones that were waking up (particularly the east coast of the USA). The earliest retweets and mentions were from passionate supporters from the Yes campaign, because it did appear to show a lot of support for them. Many journalists and news organisations also helped spread it, because it did look like an interesting angle on a huge story. In the end we saw that it was embedded or linked to by sites such as The Scotsman, The Guardian, Daily Telegraph, El Pais, The Age, Zeit, El Pais, Buzzfeed, Mashable, Vox, Huffington Post, and Daily Kos. For the next few hours we were caught up in a surreal world of seeing larger and larger waves of people mention it and view it. After seeing many great visualisations get resoundingly ignored, it was great to see one that got such great feedback. Through Google Analytics and our site logs we could see how thousands of people were watching it simultaneously. Through Twitter’s own analytics we could see the tweet engagement, and we were tracking mentions of Trendsmap and the url of the visualisation through Twitter’s advanced search. 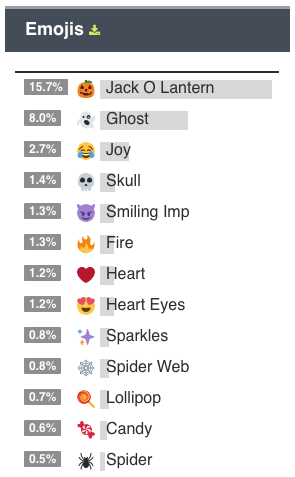 We also used our own Trendsmap analytics to get more detail on who the biggest sharers were, where they were, and what words were being used to describe it. Fortunately it was mostly “cool”. It became quite meta when the tweets about the visualisation started appearing in the top tweets within the visualisation. This was even more of an achievement because we didn’t even use the same hashtags in our original tweet (#IndyRef) as those being tracked in the visualisation. We then started getting tweets that Trendsmap itself was trending, from our trending alert accounts. We had sent the original tweet at 10.35pm our time (we are based in Australia), so by 1am our adrenalin was running low, and we decided to call it a night. We also wanted to be up early for the end of polling in just a few hours. Unfortunately this meant we missed the biggest tweet from none other than Alex Salmond himself, kicking off another big wave of interest. When we got up a few hours later we saw that it had received over almost 200,000 views and was still going strong. Gradually interest faded as the results started to come in, which of course told a different story. When the final results were announced we then saw that the No mentions did in the come out on top in the end, and it becomes quite a poignant end to such a passionate campaign, as the No mentions finally mute the Yes. And of course, there is a lesson that you cannot boil down the votes across a country to a few hashtags. Putting aside how representative Twitter can be, any group seeking change (Yes) will need to shout louder than those who were content to keep things going as they were (No). So far it has had more than 270,000 views which we are obviously thrilled with. Our original tweet has been retweeted 1,985 times to date, and had 295,065 impressions, according to Twitter analytics. Only 3% (8,255) of the views came from that original tweet, and another 26% (~60,000) from other tweets. There were actually more views from Facebook (~80,000) than Twitter (~70,000) in the end. Thanks for getting to the end of the story. We hope to have another similar story soon! If you have any ideas of visualisations you would like to see, or if you would like to test the visualisation tool when it is available, please get in touch. There was a carefully co-ordinated campaign to tweet the hashtag #WithoutTheNHS at 8pm GMT on 8th September. We tracked over 32,000 tweets, and you can see below the vast majority of those were sent within the first hour. The campaign was organised by @butnhs (Big Up The NHS) with the aim to highlight the great work the NHS (National Health Service) does in the UK. It was very successful in becoming an official Twitter trend nationally in UK, plus 13 cities. It reached #2 nationally, in Hull and Stoke-on-Trent (or should that be Stoke-on-Trend?) You can see the full iTrended report here. That about sums up the #Glasgow2014 #OpeningCeremony. We’ve used our Analytics, Visualisation and iTrended tools to find out where it got most interest. #Glasgow2014 officially trended nationally in UK, South Africa and New Zealand, plus an additional 20 cities. The iTrended report contains all the positions it reached and for how long, and you can view it here. #OpeningCeremony also trended Worldwide, in South Africa, UK and 20 other cities. You can see the iTrended report here. The Queen also trended in Ireland, South Africa and 8 cities, and Scottish Terriers even trended Worldwide! 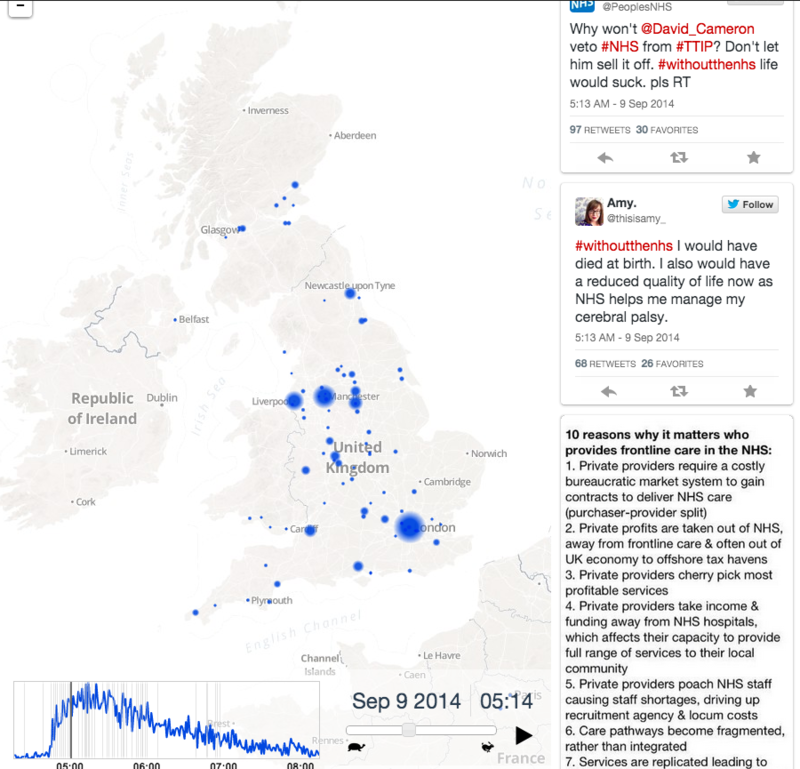 We’ve put together a visualisation that illustrates where people were tweeting about it from (mostly the UK), as well as the top tweets. Where has @wherenext been popular? Heineken launched their @wherenext campaign a week ago, with the aim to enable people to discover places that are happening on their night out. If you tweet your location to @wherenext you are then presented with nightlife options nearby. 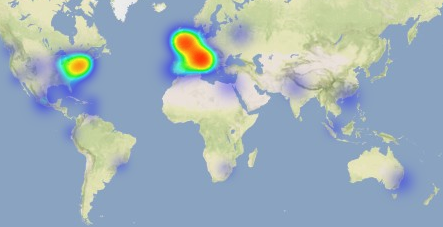 We’ve been tracking mentions of @wherenext with our Analytics tool to see where it’s been popular, and in general we’ve seen most activity in Western Europe and New York. 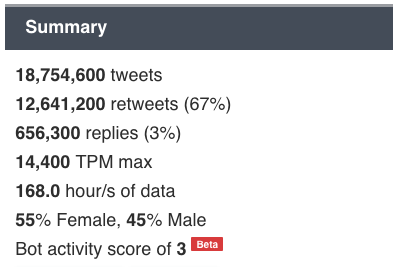 Of the 1200 tweets from 830 accounts, we located 56% to a city level. The top cities were London, Paris and New York, and the top languages were English (51%), Spanish (9%) and Italian (7%). The activity has been relatively stable since the initial peak at launch. What is noticeable though is that mentions were a lot lower over the weekend, when perhaps you would expect people to be using the service more. We also noticed that 15% of tweets mentioned the hashtag #openyourcity, which suggests that those were from accounts associated with the brand. We’ve put together a visualisation below which shows the main activity and top tweets during the week. The Alternative Press Music Awards happened last night, and #APMAs trended nationally in the US, Canada and UK, and as well as 47 cities (see the full iTrended report). APMAs also trended Worldwide, in the US and 8 cities (see the full iTrended report). As you can see it was pretty popular in a lot of other countries too. 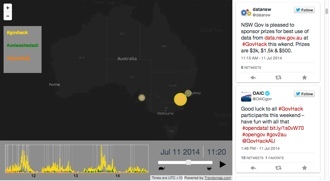 If you missed it, check out our Twitter highlights on the visualisation below. Thanks to the #GovHack and #GovCampAU organisers and participants there have been two great weekends in a row of “government 2.0” events across Australia. GovHack in Australia is a hackathon-style program, more focused on practical innovation results through the work of developers and others harnessing digital technologies and open data. GovCamp is about dialogue and ‘social knowledge’: new ways of capturing emergent challenges and innovative approaches. The two initiatives are separate with different leadership and coordination teams, but with a shared parentage so we collaborate and share ideas quite a bit. We used our Analytics and Visualisation tools to track the conversations that came out of them. GovHack is “about finding new ways to do great things and encouraging open government and open data”, and the 2014 event took place from Friday 11 July at 7:30pm until Sunday 13 July 5:30pm. 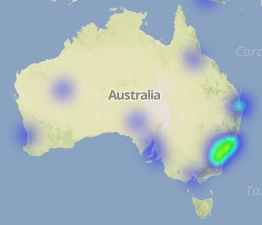 There were several events across Australia as can be seen in the heatmap and list of top cities. 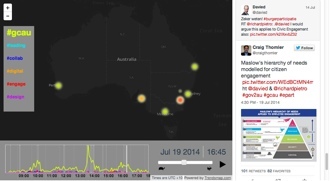 The largest amount of tweets during the event came from Canberra, closely followed by Perth and Melbourne. Overall there were 4,900 tweets from 960 different accounts during the 3 days of the event, and #GovHack officially trended on Twitter in Canberra and nationally in Australia. You can see an iTrended report of the positions it reached here. 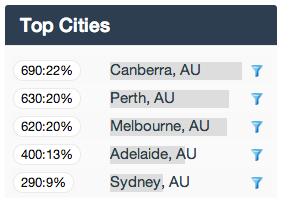 The top hashtags outside #GovHack were #unleashedadl and #opendata. Judging is now taking place, and the Red Carpet Awards take place in Brisbane on 10th August. We’ve put together a visualisation which highlights the main activity and top tweets across the 3 days. GovCamp “aims to provide open, participatory spaces for the free exchange of ideas and experience”, and the 2014 event took place on Saturday 19 July. 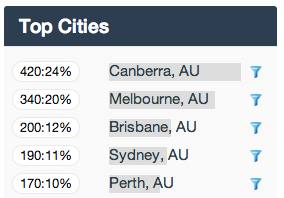 Again, there were several events across the country, and again, Canberra led the way with the most tweets, followed by Melbourne, Sydney, Brisbane and Perth. Overall there were 1,700 tweets from 360 different accounts on the day, and #GCAU officially trended on Twitter in Adelaide, Brisbane, Canberra, Darwin, Melbourne, Perth, Sydney and nationally in Australia. You can see an iTrended report of the positions it reached here. Again, we’ve put together a visualisation which highlights the main activity and top tweets across the day. Congratulations to the organisers of both events, and all participants who donated their time and energies to work towards better governments across Australia. 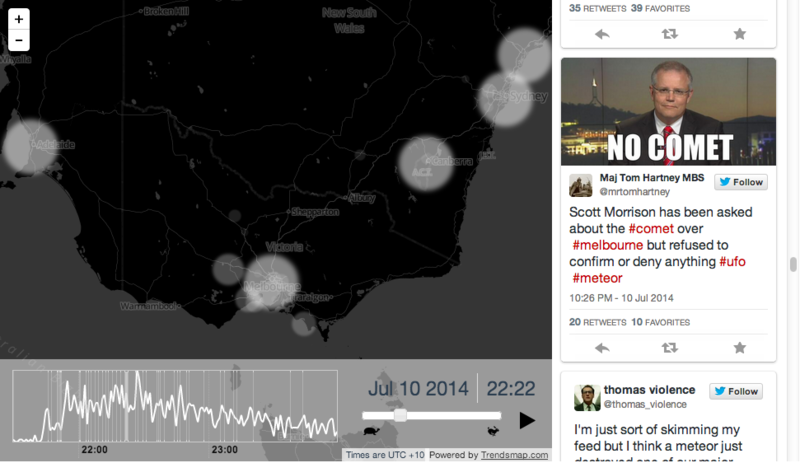 You may have heard there was a meteor visible over Melbourne last week. In case you missed it, Twitter was the ideal place to spot all the sightings, as well as the gags (usually involving Scott Morrison) that appeared faster than the speed of light. Typically, Sydney did eventually also see the meteor, but not until it was out of fashion. The last 4 weeks has seen the World Cup take over Twitter, with hundreds of millions of tweets making it a truly global event, and fortunately not a single vuvuzela. We’ve crunched all the tweets to create highlights visualisations for every single match. For each match you can see the global activity and a timeline chart for each team, as well as the top tweets. 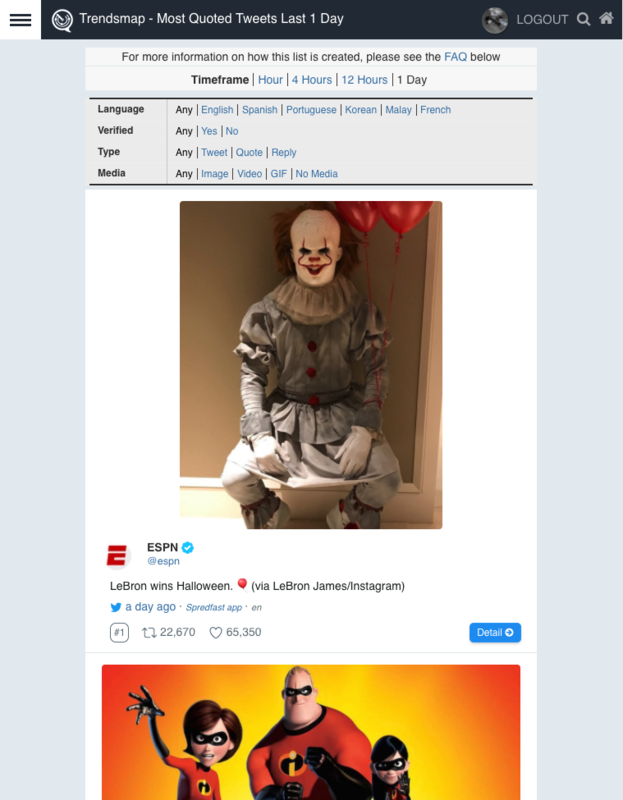 You can pause or change the speed of the animation in the bottom right, control the speed by scrolling the sidebar next to the tweets, or jump to particular moments by clicking on the timeline. The map is interactive too – so you can zoom into a particular area. Below is the visualisation for the final. Click here to see links to visualisations for all the matches. We will soon be launching this as a self-service tool, so get in touch if you would like to create these yourself.